This Display Case can hold optical items like glasses or sunglasses! 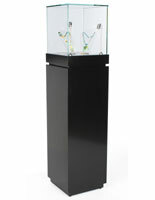 StoreFixture.com sells many more styles of display cases! 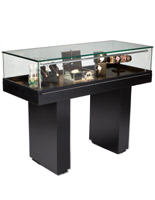 Our glass top display case adds a stylish look to your retail environment. 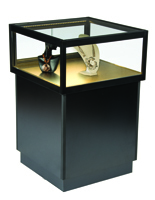 With 9" of glass height, this wooden display case is a great way to present fine antiques, jewelry or watches. 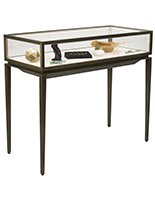 Each display case, also called a jewelry display table, has a solid wood base with a rich cherry finish. You can display your items securely under the tempered glass. We offer this display case with a sliding glass door that locks to protect your displays while still permitting for presentation. 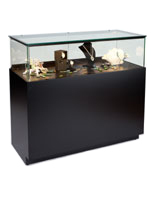 A jewelry display showcase like this solid wood display case is perfect for small offices and retail environments. 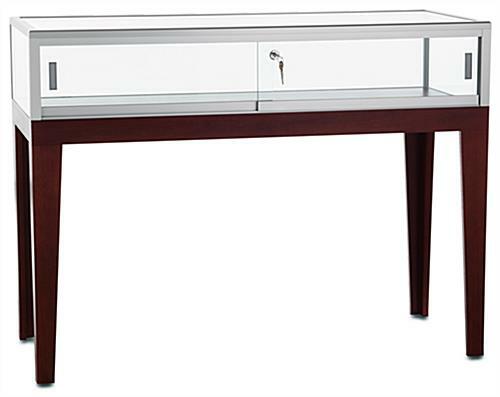 At 48" wide and 20" deep, this display table has plenty of area for showing your selection of items like eyeglasses and rings. 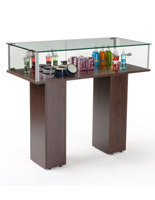 With a height of 36", this display case can also be used as a desk for discussing options with customers. A jewelry display showcase such as this glass display case is not affixed to the floor so it can be positioned anywhere within your store. 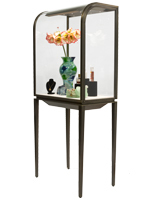 We sell this glass display case with tapered legs and a silver anodized aluminum frame. 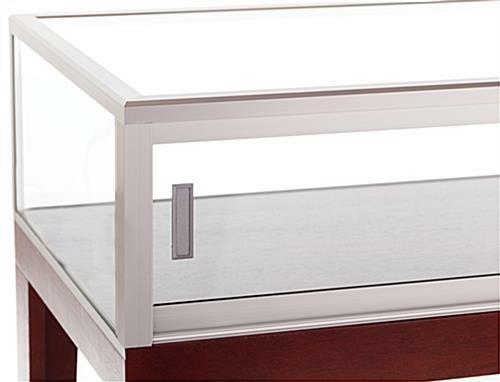 Our display case also has a cherry veneer deck that creates an inviting and elegant viewing area. This showcase is a Quick Ship model. In order to reduce lead time StoreFixture.com has completed 85% of the assembly process in advance. Please allow 4 work days for us to complete final assembly prior to shipping. Our lead time averages only 4 days, not 6 weeks like other vendors! 48.0" x 36.0" x 20.0"
48.0" x 9.0" x 20.0"